The Make program is indispensable to maintainers of free software systems. 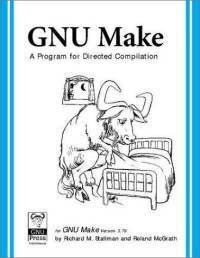 The GNU Make manual, written by the program's original authors, is the definitive tutorial. It also includes an introductory chapter for novice users. The Make utility automates the process of compilation; it is especially useful when the source files of large programs change. It is a small program with a lot of power. How the Make utility can be configured to automatically put binary and source files in the right places. How Make uses targets so that you can broaden or narrow Make's recompilation efforts on demand. This manual provides a complete explanation of Make, both the basics and extended features. There is also a convenient Quick Reference appendix for experts. Richard M. Stallman is the founder of the Free Software movement. He has also written the "Emacs Reference Manual" and Using and Porting GNU CC. Roland McGrath is the original author of the GNU Make Program.